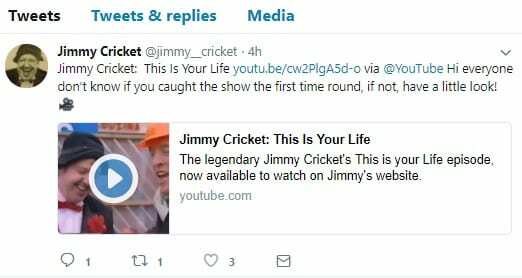 It’s more than 30 years since Jimmy Cricket was the given the red book treatment on This Is Your Life. It was on 29 September 1987 when the famous Northern Irish comedian was surprised by presenter Eamonn Andrews on a central London building site. In the show, the host popped in unexpectedly on a special guest, before going to a studio to take them through their life with the assistance of the ‘big red book’ and the help of friends and family. The programme was originally broadcast live and alternated between on the BBC and on ITV over the years. The surprise element was a very important part of the show; if the guest heard about the plans beforehand, it would be immediately abandoned. And Jimmy’s show was almost jeopardised by a one-in-a-million chance meeting the day before the surprise. Find out why and watch the whole episode below. The show was broadcast on Wednesday 4 November, the eve of Eamonn Andrews’ death.